Let us first begin with a couple simple exercises. Set your dog aside and get a partner. Position a jump, set at 8 inches, in front of you and step back from it about 5 feet, do you see the jump? Now close your eyes. The partner will spin you around three times and then lead to go over that jump, still with your eyes closed, and say jump when that person thinks you can clear the jump. Umm pretty tricky. What did that feel like? Did you listen to your partner and make the jump, or did you stumble a bit? If you made it without any hesitation on your end you have shown great trust in your partner. Did you look towards your partner with little ? or much guidance? Switch partners. Exercise two: Still with your partner, this time no spinning and no eyes closed. This time just go toward the jump on your own. In class my students don’t know I am going to do this , but as you try to go over that jump, the other person will walk in front of you, obviously blocking your view and knocking you off balance. Exercise three: In my novice classes I have all my students get to eye level with the jumps to see the dogs view. You will see this in trials that competitors will be eyeing up the jumps to see the angels. Novice students need to learn this and sometimes an excellent student needs to be reminded. It may seem like a simple thing but your jumps are one of the most important pieces of equipment out on that field. 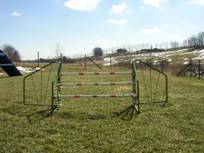 There are a variety of jumps you and your dogs will have to learn. Starting with a single bar jump to a triple jump with wings. You must see what your dog is seeing and take in account how you are asking that dog to take that jump. Are you giving him a clear view? Are you asking him to take it from the side, where all he can see is a single post? Look at your jumps carefully. Do you know your agility jumps? Note this is from the dogs view. If you try to ask your dog to jump this jump without giving him a proper view, like asking him to take the jump from the side , she will probably go around it not seeing the jump at all. This is again from the dogs’s view. The best advice is to give your dog enough running space to get to the jump, never cross in front of the dog when he is going to this jump, and then expect him to see it. Always give a clear view of the jump to your dog. Never do a blind cross before or after this jump. You are asking for them to drop a bar every time if you do. There are plenty other of jumps to learn to cut corners on, the triple is not that jump. Jump This jump looks like a wall to your dog. It’s like asking you to close your eyes and trust someone to lead you. This jump requires the most trust from your dog. Start with low heights and then work up to the proper height. Another jump that is difficult for your dog to calculate. At your dog’s level this looks like a solid floor they walk up. This is a distance jump which you can clearly see. Your dog however can not. The best way to start with this jump is to put a regular single jump in the middle of it so they understand they have to go up. You may want to use a different command like Over or Big Jump. Slowly increase the width. This is a test. Can you identify what this is? Do you think your dog can? You may use what ever commands you want for jumps. There is no rule. Being consistent with the same command for the type of jump you are asking your dog to take, be it a hand signal, a body movement, or a verbal command, being consistent is the best training tool you can have with your dog.